Cook it. Glaze it. Eat it! How do you add extraordinary island flavor to your cooking with ease? 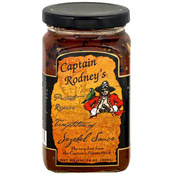 Captain Rodney's Boucan Pepper Glaze is your answer! 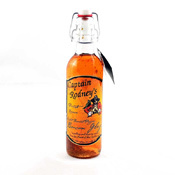 A delicious grilling and dipping sauce capturing the true flavors of the Caribbean, Boucan Glaze is an outstanding combination of Scotch Bonnet peppers, spices, vinegar, and pure cane sugar. The result is a grilling and dipping sauce perfect for brushing on fish, game, or vegetables. Family-owned and operated since 1995, the Bell Buckle Country Store, producers of the Captain Rodney's brand of Caribbean inspired sauces, has a very simple philosophy: to make the very best all-natural products possible. They use only the finest ingredients cooked slowly in small batches using time-honored methods. Adhering to a belief that the finished product is only as good as the ingredients you put in, they use only the very best; pure cane sugar instead of high-fructose corn syrup, whole fruits and berries instead of fruit syrup mixes and locally grown fresh produce rather than frozen. The Captain Rodney's brand offers a collection of unique recipes that capture the true flavor of the islands. Authentic tastes of the Caribbean, made by hand using exacting all-natural recipes, in small, open-pot batches, ensure the best quality product possible.